The use of these greatly reduce and spread the point load on a boat transom from bolting-on an outboard motor. Particularly important when a set-back jackplate or power trim unit is added. Excellent substitute grease for long discontinued Mercury Special Gear Lubricant applications of all 1940 to 1961 Mercury one, two, & four cylinder outboards, except for 1961 Merc 500. Please note that this oil pump assembly has a metal fitting to thread into the gear lubricant fill screw hole which allows the hose to remain stationary during threading. We do not prefer the plastic or metal fittings which require the whole bottle and pump to rotate as the fitting is threaded into the hole (or the hose twists, and may pinch closed). Extra Nice Used 1958-62 Mercury 4-Cylinder Clamp Brackets (pair), Swivel Bracket, and Lower Yoke for non-shock absorber models @ $119.99. Swivel Bracket inside bore is not worn as to fit with an upper yoke/swivel pin. No corrosion, original Cloud White finish mostly shows nil wear. Good Used 1958 Mercury Mark 78 (Short Shaft) Swivel Bracket with Serial Number Plate and Spring @ $74.99. Nice Used 1958 Mercury Mark 78 (Short Shaft) Upper Yoke/Swivel Pin @ $24.99. Note that early production 1956 Mark 30 and all 1955 Mark 25 & Mark 55 models utilize a different sized shim. Fits early KE4 models with cast aluminum clamp brackets. Later production models with forged aluminum clamp brackets will require a different tilt pin assembly. For replacing rusty originals, or to reinstall serial number plate after motor painting. New Old Stock Mercury Long Shaft (20") Driveshaft for use on Mark 35A, 55, 55A, 58, 58A, or Merc 300, 350, 400, & 1961 500 4-Cylinder (1955-1961) models @ $349.99. Original Driveshafts are often damaged from water intrusion pitting the (hardened) roller bearing surface above the pinion gear, grooving at the oil seal surfaces, impeller pin wear, and sometimes crankshaft spline wear (continued use with a damaged propeller and/or lack of lubrication). Will back-fit to 1961-62 Merc 700 Full Gear Shift, 1961 Merc 800 Full Gear Shift, 1963 Merc 650, 1962-63 Merc 850, and 1962-63 Merc 1000, whose decals and paint differ (1963 Merc 650 and 1962-63 Merc 1000 were factory painted Phantom Black however). Installs in hole for trim tab attaching screw (Merc 200 lower unit anode attaching bolt). Screws can be seen externally from 1955-1963 as pictured, and are hidden 1964-up to 1993 depending on the application. Quicksilver "AB" Hydro, "AB" Short, & "D"
Original Dull Aluminum paint has "shelf rash"
Undersize head machine screws and small diameter lock washers correctly fit Water Pump Housing recesses. Fits: Mercury KE4, KE7, KF7, KG4, KG7, & Mark 7, and Wizard WF7, WG7, WG7A, WJ7, WM7, & WM7A. The rubber sealing washer is compressed between the "L" washer and the water pump housing (water pump cartridge assembly). Stainless washer which installs between the gear housing cover and the sealing ring assembly (instead of aluminum on aluminum when tightening or loosening the cover). Serves as an adjustable fin to help counter propeller torque (felt on the steering wheel) when operating at higher speeds; and as an anode to help protect against corrosion (cast from zinc). (2) 5/16" thick aluminum plates with (4) blocks welded where the (4) 3/8" boat mounting holes are. The port and starboard motor attachment fixtures are bolted and welded on, and the adjustable mid-section (tower) support (has tie-down rings also) is bolted on. New (original equipment from pontoon boat manufacturer) Outboard Motor Mount Assembly for a Pontoon Boat @ $379. It is pre-drilled with three 3/8" holes per side for bolting to the underside structure of a pontoon boat. New Old Stock Berkeley Optional Droop Snoot Rudder @ $69.99. Used FEDERAL brand 13" diameter by 13.5" pitch 3 Blade Right Hand Rotation Nibral Propeller for a 1" propeller shaft @ $149.99. A second almost as nice one is available for twin motor installations. 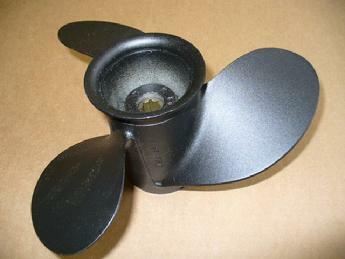 This Propeller's Blades Have Been "Cupped and Rolled" For Improved Performance. Factory Painted Cloud White with a small amount of "shelf rash"
*** Hub Kits are available for several brands of outboards, please inquire. Fits many middle horsepower to higher middle horsepower outboards. 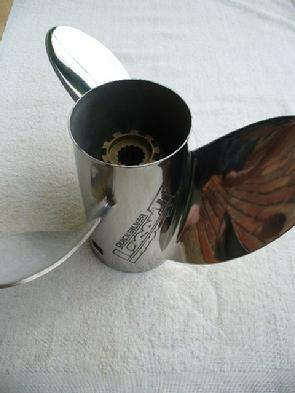 Vented Tube for faster acceleration as seen on some stainless steel high performance propellers. ***Hub Kits are available for several brands of outboards, please inquire. 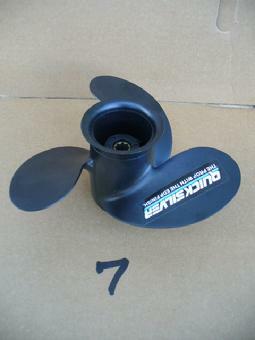 Finally, a high rake, vented tube, 4-blade high performance aluminum propeller for many middle horsepower to higher middle horsepower outboards. New Old Stock Mercury KB3, KB4, KB5, & KD3, and Wizard WB4, WD4, & WD4S Propeller Clutch (Rubber Only) @ $19.99. Note that if either (of the two) aluminum clutch member is broken or missing, then the clutch assembly pictured below would be needed instead. Eight friction plates are required for all these applications but for the earliest KF3 models which utilize a shear pin. Also note that Wizard WH6A models utilize a shear pin. Note that eight plates are required but for earlier production KF3 models which require nine, and the earliest KF3 models which utilize a shear pin. Note that Wizard WH6A models utilize a shear pin. Fits: Mercury K1, K2, K3, K4, K5, KB1, KB1A, KB2, KB3, KB4, KB5, KD3, KD3S, KD4, KD4S, KE3, KE4, & Mark 7, and Wizard WA2, WA3, WA6, WB2, WB3, WB6, WD3, WD4,WD4S, WF4, WG4, WJ7, WM7, & WM7A. Note that 1969 and newer lower units have a fine thread nut. Please check to see if the lower unit or propeller shaft has been replaced to avoid ordering the incorrect propeller nut. Note that early production 1955 Mark 55 lower units, and 1954 Mark 50 lower units, have a 14 spline propeller shaft instead of the 11 spline as these washers are utilized with. Note that early production 1955 Mark 55 lower units, and 1954 Mark 50 lower units, have a 14 spline propeller shaft instead of the 11 splines as these tab washers are utilized with. On some models above, it is referred to as the impeller hub drive pin. Installs before installation of propeller onto propeller shaft, to correctly space propeller to gear housing case. Note: Earliest production Mark 58 (Short Shaft) models utilize a different rod, so a check of your serial number is needed. Note that early production 1961 700 FGS and 1961 800 FGS models originally had a different rubber boot. "Cross Shaft" connects to the tiller handle shaft.